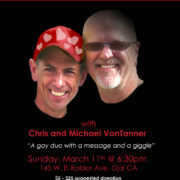 Chris and Michael VonTanner will perform original songs of laughter, compassion and political consciousness for a family audience at Greater Goods. Chris (Tanner) VonTanner has been a performing singer-songwriter for decades. He wrote and performed the acclaimed song “The Sensitive Little Boy” which is documented on Folkways Record’s ‘Walls to Roses’ album and now housed in the Smithsonian.